Don Peracchi, President of Westlands Water District, published this advertisement in the LAT over the weekend. Titled “A Little Straight Talk About Agriculture, Saving Water and Drainage,” it is certainly very straight talk - straight from the point of view of a very influential and impressively well-organized interest group. Not that this establishes a particularly high bar for why Westlands - as opposed to other territories - should survive, but in principle, despite the hubris, I agree! I’d also concede that Peracchi’s correct when he cries foul about some of the tired, old cliches Westlands’ bashers trot out - about excess water use, for example. I get tired of them, too. Westlands gets that they are an agri-culture of water that must deal with scarcity, like every other interest and entitlement. Farming requires extremely rational thinking. And if it takes a gallon of water to produce a single almond, then you’d better use that water very efficiently. What is a corporation? Is it “corporate” farming when you have - to paraphrase Peracchi - 2,250 landowners farming an average farm size of 710 acres, all or most of whom buy into a very expensive and very effective legal and public relations apparatus? Would you, family farmer, call that “family farming?” Many corporations are family businesses, too - like the Walton family. So, my definition is that when farming aggregates to 1.6 million acres, or 2,484 square miles of land, it might not be corporate, but whatever it is, that’s a lot of power for 2,250 families. I haven’t done the math, but how many gallons of water do these 2,250 families use to make a living? How many, compared to a tomato farmer in Spain? A single family of farmers, mind you - since that is the metric here. Of course. The “wasting water” argument. We’ll have to agree to disagree about whether it is a waste to maintain ecosystems on life support or to send publicly subsidized water to a factory of toxic materials and almonds. What defines “community?” In his advertisement, Peracchi also appeals to us to recognize the “communities that have grown there as a result” of the creation of Westlands. Like Punjab, India’s vicious circle of ever-increasing use and contamination of its groundwater water supply, there is perhaps no more environmentally unsustainable landscape of small communities anywhere in the U.S. If you don’t believe me, perhaps you’ll believe Facebook’s advertising algorithm. What is a waste of money? Finally, there’s Westlands’ ace in the hole: the absolutely intractable issue of who is responsible to “provide drainage services” to their salt-laced lands. I’ve already written about this Big Problem, so I won’t revisit the details of Westlands’ “we-are-the-victim-of-Government-inaction” argument. For the sake of argument, though, let’s just say Westlands’ advocates are right, that their 2,250 family farms are the victims here. So what’s next? Shall continued hundreds of millions of dollars be spent by them and others in perpetuity on legal battles and local infrastructures to mediate and remediate what is obviously an insoluble situation? Westlands gets water, Westlands irrigates land, Westlands produces a toxic drainage soup that cannot enter the Delta. “Don’t look at us,” Westlands claims. Not our problem. Their’s or someone else’s, it is most definitely a problem, one that has no technical solution. It seems to me that this is pretty simple math that the owners of Westlands property, smart people, probably get. If you look at a time scale of 50 years, which is the time scale that should be looked at here, the only rational solution is for the Feds to buy out Westlands “family farms.” Give them their money. They win - move onto the fourth inning. They are so picked on. Mr. Peracchi drones on with tired cliches that are no more or less true than those used by some of his detractors. Mr Peracchi proudly tells us that “not a drop of drain water has left Westlands after 1986”, yet their downhill neighbors the Grasslands Drainers continue to deal with their sewage coming down the hill necessitating multiple 10 year exemptions from the SWRCB discharge requirements. I agree with you that the only long term solution is to buy them out and end the irrigation,just don’t hold your breath waiting. Unless and until they are allowed to retain and upgrade their water rights to senior status they are not for sale. The water is the prize not the land. If we buy them out and they retain their water rights they win and taxpayers lose. If we buy them out and they lose their water rights the taxpayers, both state and federal, win. Chris hits the nail on the head and is the point missed by just about everyone…it is t the land that is the prize, it is the water. WWD knows it has to fallow their toxic land…planting permanent crops within their boundaries has never been about the long term crops, it has always been about the water allotments. As expressed by Hank Nordhoff, former Delta Stewardship Council appointee from San Diego, it is about putting OUR public trust resource, water, to the highest economic value and folks, crops are NOT the highest economic value for water! But Tejon Ranch, Newhall Park, Saltflats development in Redwood City to name just three, all depend on water exported from the Delta to be built. As always, read their EIR documents where the must declare where the water will be supplied from for a start and then follow the money. The money trail leads right back to the stole. kern Water Bank. Every. Single. The reference to Westlands in comparison to “growing crops in a saline estuary” referring to the Delta fertile farmland is incorrect and misleading. The Delta Estuary is NOT saline. It may become that way if the exporters are allowed to continue over-exporting and surely will become salt water if the BDCP Delta Tunnels are built. But that is the crime and the hoax. Westlands is robbing fresh water from the north and will ruin fertile Delta farmlands in order to irrigate selenium laced, damaged land to sell profitable almonds to Asia. They claim it’s family farms. As you drive down I-5 through endless almond orchards do you see any family farmhouses? No. Schools? No. Farm communities? No. Drive through the Delta if you want to see family farms, schoolhouses, churches and communities. Yes, of course, of course - it’s about the water, not the land, which is nigh on worthless without the water. And of course the buyout would have to include buying out whatever “water rights” they have. As for “growing crops in a saline estuary:” sure, it’s a quite a lot more shaded than that, depending where you are in the Delta, what time of year it is, how much water is being “not wasted,” and so on. So calling the Delta saline may be a rhetorical flourish, but so is “the crime and the hoax,” “robbing,” etc. I’ve got no problem with either. Unfortunately John it feels like we’re headed for a worst case scenario. Yeah, I saw that, Chris - and you might be right. One should try to be glass half full whenever possible, don’t you think, and in order to do that, I will continue to hammer at Westlands every chance they give me. Like this time. 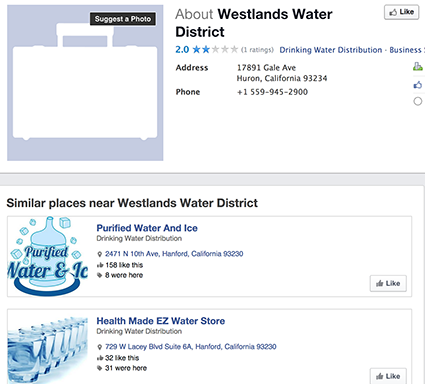 Any rational and neutral person who looks at the full extent of the water supply and demand issues will ultimately conclude that it is Westlands, more than any other single interest. that should be left without a chair when the music stops. It just hasn’t stopped yet. Yes, whether this rational conclusion has any utility in a culture defined by a century and a half of “greed is good” tradition and ideology, talented lawyers and pr flacks, and indifference - who’s to say?